Cars. Design. Celebrity. 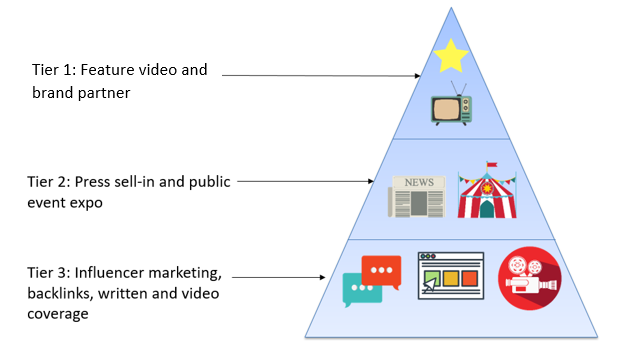 The holy integrated video campaign trinity. How often can you say you’ve seen a flawlessly executed integrated video campaign? It’s a thing of rarity and of beauty. Few have impressed us as much as the 2016 campaign for the then-new DS3 car by Citroen, featuring the sensational Iris Apfel and rocking the slogan; “Driven by style”. It was so darn good we’ve gone ahead and made it a case study – a barometer for a beautifully done integrated video campaign. This is what we learned from it. Before we delve into the beauty of the DS3 campaign itself, we want to show you something. We have to give full credit for the following diagram to our business pal Lea Rice, of Lea Rice Communications, for coming up with the campaign pyramid concept, which was based on the DS3 campaign. Tier 1: This is where the biggest percent of your budget is allocated. It also features a brand partner or influencer you may have on board who should ideally have a mass appeal (at least within the niche of your target audience) who fits with the concept of the campaign, with a widespread distribution platform. For the DS3 Driven By Style campaign, this took the form of their beautifully shot TV advert, starring artist and design muse Iris Apfel. Tier 2: This takes the high budget TV ad (or whatever your top tier looks like for you personally) into more accessible places, and provokes a spread of coverage to get people talking about their video, and therefore their new car. This tier is also where social media cut downs of your video come into play – the release of these should line up with your press sell-in. A sell-in for online and offline press seeded the story of the car further into the public’s awareness, while showcase events took place throughout the Summer at Westfield shopping centre, London. The latter, of course, allowed Citroen to bring to life the artistic direction of the TV ad as well as open the floor to the ol’ car salesmen. Tier 3: Citroen invested in influencer marketing with a great mechanic. They reached out to fashion, beauty and lifestyle bloggers in London and the Home Counties to attend the Westfield showcase on any of the dates it was there for. 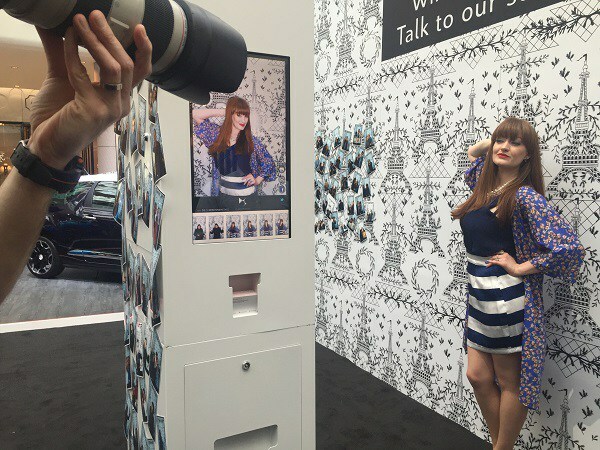 Each blogger was given a £100 Westfield voucher and set a challenge to put together an Iris Apfel inspired look within one hour (Iris Apfel glasses provided, naturally), then return to the expo space to get changed and do a quick photoshoot against the same Paris backdrop from the advert. The bloggers – who had been chosen because they had the same readership as the DS3’s target audience – would then return home to write up and publish their experience with DS3, amazing photos in hand, and having already promo’d the company on social media as they crowdsourced ideas from their followers during the outfit challenge. To really hammer that sales point home, each partaking influencer was also allowed the opportunity to test drive a DS3 for a week. This coverage created conversations among the exact audiences Citroen wanted to reach, who would already be initiated to the brand from the TV ad and press coverage, and were now hearing from their favourite influencers about the great brand experience they’d had with that very same car. And that, ladies and gents, is how you pull off a seriously strategic integrated video campaign. Plan that trickle down effect detailed in the campaign pyramid above right at the start of your campaign planning. This is not about shoe-horning bits in as you go, it’s about clever, calculated strategy. It takes an average of seven interactions with a brand before the target audience considers a purchase. Think hard about how those touch points will get to your audience. Offline brand experiences are not dead, and can return better ROI for you if you give them multi-purpose roles. Invest in influencers that compliment your brand and product. Sure, your budget may not be that of Citroen’s. But don’t throw this framework out of the window just because the figures aren’t the same. Adjust it to your own budget and your own offering, and keep implementing what works for your brand in the future, increasing the budget you invest each time (because, all being well, you’ll find yourself making a bigger profit with every campaign). Not sure where to start? We have some great ideas for you. Why not drop us an email?